On May 25, 1961, President J.F. Kennedy stood before Congress to deliver a special message on "urgent national needs." He asked for an additional $7 billion to $9 billion over the next five years for the space program, stating to Congress: "This nation should commit itself to achieving the goal, before the decade is out, of landing a man on the moon and returning him safely to the earth." On July 20, 1969, Apollo 11 landed on the moon with Americans Neil Armstrong and Buzz Aldrin walking on the moon. Here is a video of the Nvidia Apollo 11 Lunar Landing Demo running on the Asus Strix GTX 970 graphics card. There are conspiracy theorists who believe that the photos of the Apollo 11 lunar landing are forgeries because of inconsistencies in the lighting. Why can Buzz Aldrin be seen when he is in a shadow? Why aren’t there any stars? Did we just see a studio light? 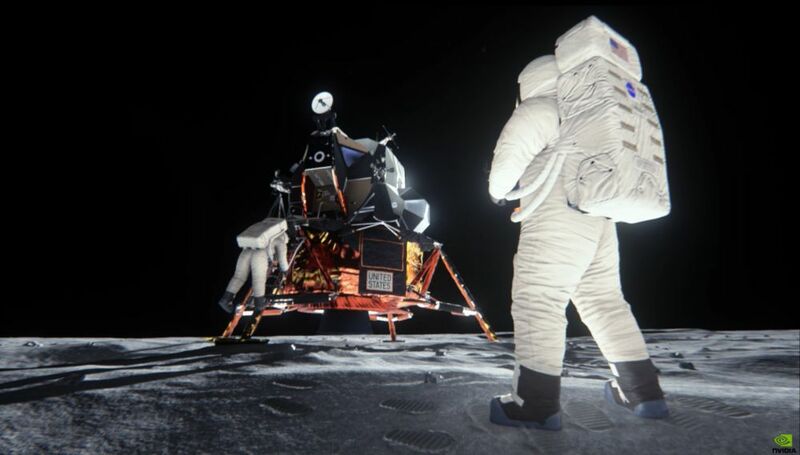 Powered by Nvidia Maxwell™ GPU architecture and Epic’s Unreal Engine 4 and using Nvidia's Voxel Global Illumination (VXGI), Nvidia set out to explore the Apollo 11 landing site and the landmark photo of Buzz Aldrin descending to the moon’s surface in an effort to dispel the conspiracy theory. I believe the lunar landing happened but I don't really see the Nvidia recreation as proof, even though Nvidia did present a good explanation on light bouncing effects. All it really tells me is that in 2014, a studio photo shoot is not necessary because the alleged hoax can be created using high-powered graphics processing. Excellent 3D Rendering for my 3D Design/Modelling needs. Superb graphics for Assassin's Creed Unity. Impressive display of the Nvidia Apollo 11 Lunar Landing Demo.